Paget's disease of bone (PDB), also known as osteitis deformans, is a chronic metabolic bone disorder affecting either single (monostotic) or multiple bones (polyostotic). It is characterized by abnormal bone remodeling giving rise to a disordered and hypervascular bone. This chaotic bone architecture results in the loss of structural integrity. PDB is more common in people of European ancestry, and is rarely seen in African and Asian populations. It is usually a disease of geriatric age group presenting above 50 years of age with male preponderance. PDB is asymptomatic in most of the patients and is generally diagnosed incidentally while undergoing radiological evaluation for some other reason. When symptomatic, common manifestations include bone pain, hearing loss, pathological fractures and deformities of the skull, and long bones. Serum alkaline phosphatase (ALP) is a sensitive marker of disease activity that can be used to screen the patients. Bone scintigraphy is useful for determining the extent of the disease. Both these parameters are helpful in monitoring the treatment response. The main aim of treatment in active PDB is to suppress the accelerated bone turnover and bisphosphonates (BPs) are used for this purpose since decades. BPs lead to the reduction in disease activity, symptomatic improvement, and normalization of bone turnover markers. They have also been shown to give rise to normal lamellar bone in place of woven bone that characterizes PDB. Various studies have shown that intravenous zoledronic acid (ZA) is superior to other BPs., Patients respond to ZA more rapidly when compared to oral BPs and the response is complete and sustained. Recent guidelines have advocated treatment with a single intravenous infusion of 5 mg ZA as the treatment of choice. PDB is a rare disease in Indian subcontinent. There is paucity of long-term follow-up data regarding the treatment response to ZA in this population. In addition, follow-up data for 4 mg ZA in this part of our country is lacking. Thus, the main objective of our study was to assess the response of 4 mg intravenous ZA in Indian patients with active PDB. This study was carried out at a tertiary care center in India between January 2011 and June 2017. During this period, 17 patients of active PDB attended endocrinology clinic. Two patients who received BPs other than ZA (ibandronate/alendronate) and another two patients who did not complete 6 months of follow-up were excluded from this study. 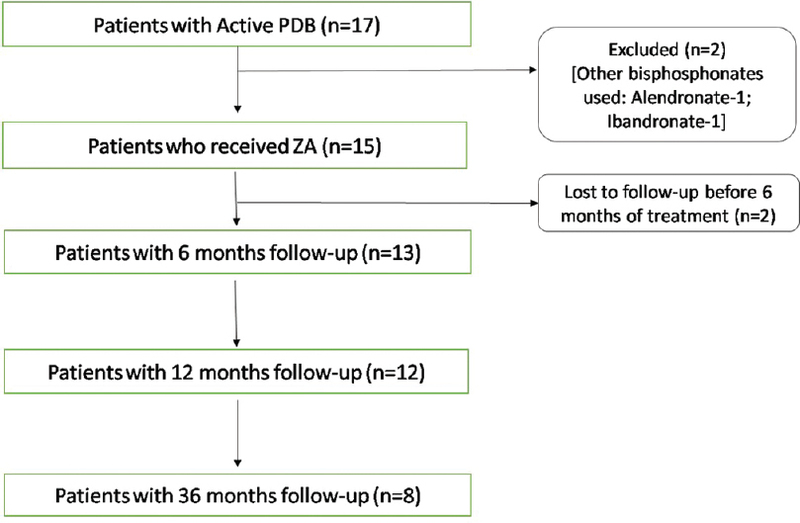 Retrospective data of 13 patients with active PDB who were diagnosed and treated with ZA and completed at least 6 months of follow-up were included in this study [Figure 1]. The study was approved by the Institutional Ethics Committee. Patients were diagnosed as active PDB based on clinical, biochemical, and scintigraphic profiles and were treated with a single intravenous infusion of 4 mg ZA. Dose of 4 mg of ZA was used as it was the only formulation available at our institute. Baseline clinical data were obtained from department registries. History, physical examination, and audiometric findings were noted. Clinical improvement was assessed based on the follow-up records depicting the estimate of pain reduction that was based on self-assessment by the patient in comparison to the severity of pain at baseline. Fasting serum sample was used for the measurement of ALP, calcium, phosphorus, creatinine, lipid profile, liver function tests, and 25-hydroxy vitamin D [25 (OH) D]. The normal reference range of total serum ALP was 100–250 IU/L. Normalization of serum ALP or a reduction of at least 75% from the baseline level at 6 months of follow-up was regarded as therapeutic response. Return of serum ALP to within 20% of the pretreatment baseline level after remission was regarded as relapse. Pre- and 6 months post-treatment, serum ALP values were available for all 13 patients. One-year post-treatment serum ALP values were available for 12 patients as one patient has just completed 6 months of follow-up and 3 years post-treatment values were available for eight patients. Bone scintigraphy was performed for determining the extent of the disease at baseline and at 12 months of follow-up after administration of ZA. It was performed by administering 20 milliCurie of Technetium 99m-methylene diphosphonate intravenously followed by the acquisition of lateral images of the skull and whole-body images after 3 h. For quantitative scintigraphy, two indices, namely scintigraphic ratio (SR) and scintigraphic index of involvement (SII), were used. SR measured disease activity of each individual bone lesion, whereas SII measured cumulative disease activity of all the involved bones together in an individual patient. These two indices were previously described in the literature and were used to measure scintigraphic activity in PDB. We have measured these indices in seven of our 13 patients for whom good quality bone scan images were available, both at baseline and at follow-up. The radiographic skeletal survey was done in all the patients at baseline and at 12 months follow-up and radiographs were analyzed by an expert radiologist. Data were analyzed by using Statistical Package for the Social Sciences (SPSS) software version 19. Data were checked for normality, and paired sample “t” test and repeated measure analysis of variance (ANOVA) were used to compare mean and standard deviation (SD). For nonparametric data, Wilcoxon signed-rank test was used. The difference was considered statistically significant if P value was <0.05. Among 13 patients, 12 were males and the mean age of presentation was 66.7 years (age range: 55–86 years). The mean duration of follow-up in our study was 35.2 ± 16.8 months. Bone pain was the most frequent (92%) presenting complaint. One patient was referred to our department as he was incidentally found to have an isolated elevation of serum ALP levels with normal liver function tests. Two patients complained of headache. The bone deformity was present in four patients, out of which two had bowing of tibia, one had deformity involving shaft of the femur, and one patient presented with frontal bossing. Two of our patients (patient 1 and 11) had fissure fracture(s) at presentation. Patient 1 had three fractures on the lateral aspect of the left femur and patient 11 had one fracture on the lateral aspect of the left tibia. One patient presented with the osteolytic destruction of the head of left femur and later underwent total hip replacement surgery. Six patients had audiometrically confirmed hearing impairment. Osteoporosis was present in five patients and dyslipidemia was noted in six patients. Six of our patients had hypertension. Serum ALP level at baseline was 1190.9 ± 666.1 IU/L. 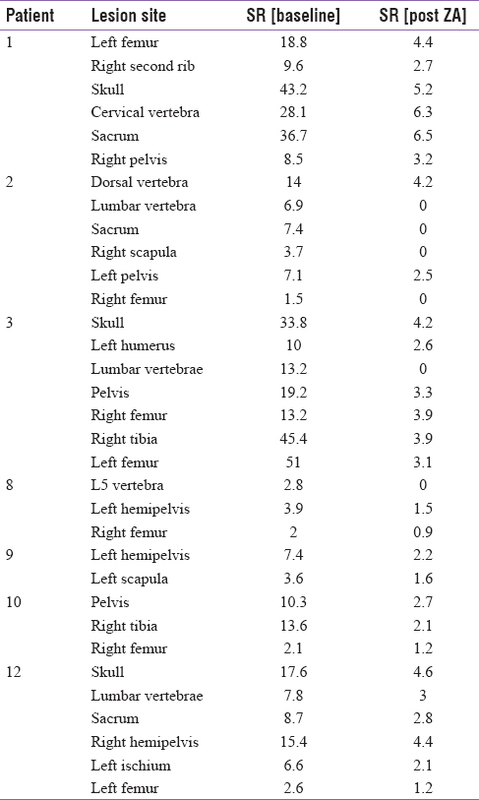 Bone scintigraphy was available for all patients at baseline and pattern of involvement is given in [Table 1]. All patients had polyostotic disease, and pelvis was the most common affected site. Skull involvement was seen in five patients (38%) and all of them had ALP levels ≥1000 IU/L at presentation. At baseline, median SR was 9.6 [interquartile range (IQR) 5.25–18.2] and median SII was 9.9 (IQR 5.6–28.5). All 12 patients, who at presentation had bone pain, reported significant clinical improvement. All of our patients showed a therapeutic response at 6 months, of which 11 achieved normalization of serum ALP. At 1 year, serum ALP levels of 12 patients were available and all were in the normal range. Serum ALP levels at 36 months were available for eight patients and all were in the normal range indicating durability of remission. Four of our patients have not completed 36 months of follow-up, and for one patient (patient 2) third-year data was not included, as he was given a second dose of intravenous ZA for osteoporosis at the 18th month of follow-up. Serum ALP decreased significantly at 6 months (200.5 ± 68.4 IU/L). It further decreased to 174 ± 33.6 IU/L at 12 months (n = 12) and remained stable at 176.5 ± 50 IU/L at 36 months (n = 8). The difference between serum ALP values at baseline and 6 months was statistically significant (P < 0.001). There was no significant statistical difference between values at 6, 12, and 36 months (repeated measure ANOVA, P = 0.13), indicating that the biochemical response achieved at 6 months was sustained for at least 36 months. Nine of our patients had serum 25 (OH) D levels ≤20 ng/mL and four had levels between 20 and 30 ng/mL. The patients with vitamin D deficiency were adequately supplemented with cholecalciferol before ZA infusion. At baseline, bone scan identified a total of 67 lesions in 13 patients. Follow-up bone scan done at 12 months after treatment was available for 10 patients as two patients denied repeat bone scan and one patient was yet to complete 12 months of follow-up. Median SR reduced to 2.7 (IQR 1.20–4.05, P < 0.001) and median SII reduced to 3 (IQR 2–4, P = 0.018) at follow-up. Out of the 33 lesions for which SR was measured, six lesions healed completely and rest of the lesions showed significant scintigraphic improvement [Table 2] and [Figure 2]. Four of our patients suffered from mild flu-like illness following ZA infusion. This was taken care of by oral paracetamol. None of the patients had developed hypocalcemia, hypophosphatemia, atrial fibrillation, or renal dysfunction. BPs have been used to treat patients with active PDB for decades. The current study throws light on the pattern of presentation of patients with active PDB in Indian population. A single intravenous infusion of 4 mg ZA resulted in a therapeutic response in all of our patients and this response was sustained for 3 years. This is in line with the results obtained from previous studies. Reid et al. performed a joint analysis of two multicenter double-blind randomized clinical trials comparing a single infusion of 5 mg ZA and 60 days of oral risedronate (30 mg per day) treatment for PDB. Primary endpoint was the rate of therapeutic response at 6 months, which was defined as normalization of ALP or reduction of 75% or more in serum ALP excess. It was achieved in 96% of the patients on ZA as compared with 74.3% on risedronate. Median time to response was significantly shorter in patients on ZA as compared to risedronate (64 vs. 89 days). Follow-up of the same cohort showed that a significant number of patients on ZA remained in remission for as long as 6.5 years. The relapse as defined by the return of serum ALP to within 20% of baseline value was seen in 0.7% of the patients on ZA, whereas it was 20% in patients on risedronate. Cundy et al. did follow-up of 107 PDB patients who were treated with a single intravenous infusion of ZA between 2005 and 2009. Two preparations of ZA were used in this study: 4 mg till May 2008 and 5 mg thereafter. Mean age of patients at baseline was 76 years. Moreover, 46% of the patients had previously received other BPs. Sequential measurements of procollagen type I N-terminal propeptide (P1NP) was carried out for up to 10 years. At the end of 9 years, 64% of the patients showed partial loss of effect as defined by doubling of P1NP levels from the post-treatment nadir value. However, relapse, which was defined as a P1NP value >80 μg/L was observed only in 14% of the patients. Baykan et al. in their retrospective study of 12 patients showed that remission occurred at 6 months and was sustained till 18 months following a single dose of intravenous ZA. Tucci studied the effect of ZA in 14 patients with PDB who had previously received other BPs but had either failed to achieve remission or to maintain it for more than 12 months. Treatment with ZA resulted in remission in 13 out of 14 patients, lasting from 12 to 60 months. 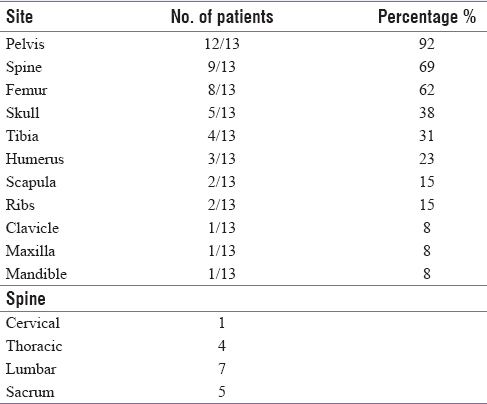 Belgian Paget's disease registry was reviewed by Devogelaer et al., who found the response rates to be 93.3% at 1 year, 89.5% at 2 years, and 91.6% at 3 years after single infusion of ZA. In our study, all 13 patients achieved biochemical remission by 6 months of treatment. All the patients who had completed 3 years of follow-up continued to be in remission. Prolonged normalization of markers of bone turnover as achieved by ZA has been shown to be responsible for the reduction of symptoms and complications. All the patients who at baseline had bone pain reported significant symptomatic improvement. Serum ALP is the marker of overall disease activity. It gives no information about the activity of individual lesions, which can be assessed scintigraphically with the use of SR. Avramidis et al. quantitatively assessed scintigraphic data with the help of SR and SII in nine patients and showed that scintigraphic response was achieved as early as 3 months and was sustained until at least 12 months post single infusion of ZA. In our study, all the 33 lesions that were analyzed quantitatively showed significant improvement with six lesions healing completely at 12 months. Intravenous nitrogen-containing BPs are known to cause acute phase reactions characterized by flu-like illness after first dose in 10–30% of the patients. Proinflammatory cytokine production is believed to be the cause for this phenomenon. In our study, four patients suffered from such flu-like illness, which was ameliorated by acetaminophen administration. The novelty of our work lies in it being the first study to evaluate the effects of ZA in active Indian PDB patients. None of the previous studies have used ZA in this population group.,, The major strength of our study is the uniformity of BP used, as only patients who received ZA were included. All our patients were treatment-naïve. In addition, apart from clinical and biochemical evaluation, scintigraphic parameters were also analyzed quantitatively. The major limitations of our study are its retrospective design, limited duration of follow-up, and unavailability of other bone turnover markers. Our sample size was small because PDB is much less common in this part of the world. We report the significant clinical, biochemical, and scintigraphic response to a single therapeutic dose of ZA in a cohort of Indian patients with active PDB. Gruener G, Camacho P. Paget's disease of bone. In: Handbook of Clinical Neurology. Elsevier; 2014. p. 529-40.
Cooper C, Harvey NC, Dennison EM, van Staa TP. Update on the epidemiology of Paget's disease of bone. J Bone Miner Res 2006;21:P3-8. Ralston SH, Langston AL, Reid IR. Pathogenesis and management of Paget's disease of bone. Lancet 2008;372:155-163. Cundy T. Paget's disease of bone. Metabolism 2018;80:5-14. Al-Rashid M, Ramkumar DB, Raskin K, Schwab J, Hornicek FJ, Lozano-Calderón SA. Paget disease of bone. Orthop Clin North Am 2015;46:577–85. Miller PD, Brown JP, Siris ES, Hoseyni MS, Axelrod DW, Bekker PJ. A randomized, double-blind comparison of risedronate and etidronate in the treatment of Paget's disease of bone. Paget's Risedronate/Etidronate Study Group. Am J Med 1999;106:513-20. Reid IR, Nicholson GC, Weinstein RS, Hosking DJ, Cundy T, Kotowicz MA, et al. Biochemical and radiologic improvement in Paget's disease of bone treated with alendronate: A randomized, placebo-controlled trial. Am J Med 1996;101:341-8. Reid IR, Miller P, Lyles K, Fraser W, Brown JP, Saidi Y, et al. Comparison of a single infusion of zoledronic acid with risedronate for Paget's disease. N Engl J Med 2005;353:898-908. Krane SM. Is a single infusion of zoledronic acid more effective than oral risedronate for the treatment of patients with Paget's disease? Nat Clin Pract Rheumatol 2006;2:186-7. Reid IR, Lyles K, Su G, Brown JP, Walsh JP, del Pino-Montes J, et al. A single infusion of zoledronic acid produces sustained remissions in Paget disease: Data to 6.5 years. J Bone Miner Res 2011;26:2261-70. Singer FR, Bone HG, Hosking DJ, Lyles KW, Murad MH, Reid IR, et al. Paget's disease of bone: An endocrine society clinical practice guideline. J Clin Endocrinol Metab 2014;99:4408-22. Avramidis A, Polyzos SA, Moralidis E, Arsos G, Efstathiadou Z, Karakatsanis K, et al. 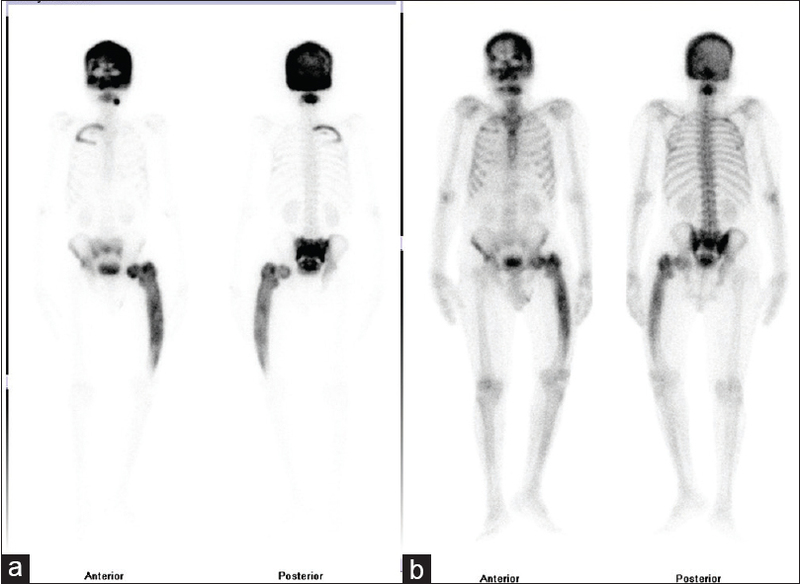 Scintigraphic, biochemical, and clinical response to zoledronic acid treatment in patients with Paget's disease of bone. J Bone Miner Metab 2008;26:635-41. Cundy T, Maslowski K, Grey A, Reid IR. Durability of response to zoledronate treatment and competing mortality in Paget's disease of bone. J Bone Miner Res 2017;32:753-6. Baykan EK, Saygılı LF, Erdogan M, Cetinkalp S, Ozgen AG, Yilmaz C. Efficacy of zoledronic acid treatment in Paget disease of bone. Osteoporos Int 2014;25:2221-3. Tucci JR. Zoledronic acid therapy of patients with Paget disease of bone resistant to or with unsustained remission following prior bisphosphonate therapy. Endocr Pract 2015;21:1111-6. Devogelaer JP, Geusens P, Daci E, Gielen E, Denhaerynck K, MacDonald K, et al. Remission over 3 years in patients with Paget disease of bone treated with a single intravenous infusion of 5 mg zoledronic acid. Calcif Tissue Int 2014;94:311-8. Hosking D, Lyles K, Brown JP, Fraser WD, Miller P, Curiel MD, et al. Long-term control of bone turnover in Paget's disease with zoledronic acid and risedronate. J Bone Miner Res 2007;22:142-8. Drake MT, Clarke BL, Khosla S. Bisphosphonates: Mechanism of action and role in clinical practice. Mayo Clin Proc 2008;83:1032-45. Bhadada S, Bhansali A, Unnikrishnan AG, Khadgawat R, Singh SK, Mithal A, et al. Does Paget's disease exist in India? : A series of 21 patients. J Assoc Physicians India 2006;54:530-4. Anjali NT, Rajaratnam S, Shanthly N, Oommen R, Seshadri MS. Paget's disease of bone: Experience from a centre in Southern India. J Assoc Physicians India 2006;54:525-9. Joshi SR, Ambhore S, Butala N, Patwardhan M, Kulkarni M, Pai B, et al. Paget's disease from Western India. J Assoc Physicians India 2006;54:535-8.